When a heartbroken Samantha “Sammy” Kane returns to her hometown of Heartsford, Wisconsin for her best friend Kate’s funeral, she learns that Kate’s much-loved craft store is in danger of perishing with its owner. Confounding all her expectations of the life she would live, Sammy moves back home with her golden retriever and takes over Community Craft. A few doors down Main Street, fellow new arrival Ingrid Wilson has just opened the Yarn Barn, a real “purl” of a shop. But when Sammy strolls over to see if Ingrid could use a little help, she finds Ingrid’s dead body―with a green aluminum knitting needle lodged in her throat. Detective Liam Nash is thrown for a loop as every single citizen of Heartsford seems to have a theory about Ingrid’s murder. And nearly everyone in town seems to be a suspect. But the last time Sammy did any sleuthing was as a little moppet. And this is not fun and games. Sammy is eager to help the handsome Liam―who seems to be endlessly inventive in finding reasons to talk with her―and when Liam arrests affable woodworker Miles Danbury, Sammy puts everything on the line to help clear Miles. As the case comes dangerously close to unraveling, Sammy must stitch the clues together. 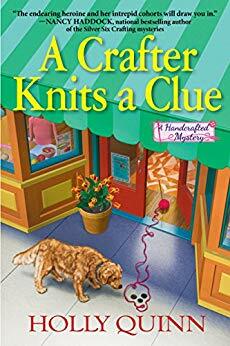 But the killer has other plans―and if Sammy’s not careful, she may wind up in a perilous knot in A Crafter Knits a Clue, the first warm and woolly yarn of Holly Quinn’s new Handcrafted mysteries. Q: Sammy, how did you first meet Holly? A: I was working in my craft shop that I’ve taken over after my best friend Kate died tragically. I was minding my own business, when she came in inquiring why I keep finding dead bodies. A: Because honestly? I think the universe knows I’m very curious and can dig into an investigation-even if it gets me into a heap of trouble. Plus, I drag my sister and my cousin into my shenanigans which leads to nothing but fun! A: “Come on now! That would be a DEAD giveaway,” she laughs! Q: Did you have a hard time convincing Holly to write any particular scenes for you? A: It’s not as easy as it looks setting up a new series. Keeping pace and unfolding characters that will weave throughout the series amid an early murder makes it a challenge. There are definite bumps in the road. The pace definitely picks up as the story unfolds. Q: What do you like to do when you’re not being read somewhere? A: Take my dog Bara for a long walk on a trail. Actually, I spend way too much time at the Sweet Tooth Bakery next-door gorging on Marilyn’s tantalizing treats. Or across the street drinking coffee at Liquid Joy. The owner Douglas pretty much has a permanent seat for me by the window. A: I would make people understand my passion for finding the truth. I will go to great lengths to uncover it. I hope people don’t find fault with this and see me as annoying because I can be a pretty straight shooter too. A: I love them, how could I not? We all have our foibles . . . My sister might be a little neurotic and my cousin is a gorgeous free-spirit, but the three of us SHE’s (and I do mean that literally) stick together. Our initials spell out S.H.E. S-Sammy, H-Heidi, and E-Ellie. I tease them sometimes about the SHE detective agency of our youth- they’re under the impression, I haven’t stopped playing . . . ha-ha! Q: Do have any secret aspirations that Holly doesn’t know about? A: No, they unfold as she follows me around like a puppy-Ha! A: Go on a romantic date with Detective Liam Nash. A: Sometimes I can come off a little impulsive or high-spirited. I hope people know my heart is in the right place. I just want justice, you know? Especially for those I love and the town I love-Heartsford. People who know me, trust that I always have the best intentions even though I might not totally think before I speak. A: I lost my best friend Kate. I’ve taken over her store, but still working on living up to her legacy. She was so loved and cherished in this town. She created a sense of community kindness that I’m still aspiring to. I’m learning to love like she did. I’m learning to open my heart and love people without judgment and help when they need it. That was Kate. And I miss her. Q: Do you have a BFF besides Kate? A: I also have a furry best friend, his name is Bara, and I couldn’t live without my golden retriever! A: Getting too close to people and then losing them. Q: What’s the best trait your author has given you? A: I have a heart for the truth and justice, and I’ll dig until I find it. I don’t think before I speak, sometimes people find that unlikable. Q: What do you like best about your fellow character, Heidi? A: She’s beautiful inside and out. She has a huge nurturing heart which is why she’s a nurse at the local hospital. I hate when she wears her scrubs around town in public places after her shift. Doesn’t she realize she’s full of germs? Ick! Q: What’s Holly’s worst habit? A: She doesn’t live in the present moment. The only time she lives in the present moment is when she’s writing about me. Q: What aspect of Holly’s writing style do you like best? A: The fact that she doesn’t hide my voice. She tells exactly what’s in my head-even if sometimes it may come off inappropriate. A: One of the actresses from Hallmark-definitely! Erin Krakow, Lacey Chabert (although they might be a little too sweet to play me). Maybe more Candace Cameron Bure, as she’s a little more confident and assertive on screen (but she’d have to dye her hair–I’m brunette with red highlights). A: Heartsford, Wisconsin is a fictitious town based off a real town–Hartford–along with characteristics taken from other Main Streets in small midwest towns. Heartsford is a pretty special place. Kate used to say, “Where the small-minded gossips might be big, but the people’s hearts are BIGGER in our little ole town of Heartsford.” Ha-ha! Marilyn owns the Sweet Tooth bakery, Douglas owns Liquid Joy, and we three S.H.E.’s hang out at the Corner Grill–a little more than we should. There is a river walk that snakes through the town and a local flower committee that keeps the grounds filled with seasonal beauty. It’s a great town, really. You should put it on your list of places to visit! A: Most likely that it’s not just me really . . . it’s us three SHE’s . . .
Q: Will you encourage Holly to write a sequel? A: She’s already working on the 3rd . . . so YES, the sequel is coming, and a sneak peek behind the pages . . . the reader will learn what happened to Kate. Holly Quinn is both an avid reader and crafter. Holly sells her artistic creations locally and dreamed of one day opening a gift shop to sell local artist's handiwork. Instead, she began writing about it and thus her journey of the Handcrafted Mystery series was born.